A summery dish of red onion wedges with tender chicken marinated in a zingy combination of flavours, including lemon, garlic and oregano. Preheat the oven to 200ºC, gas mark 6. If using wooden skewers, soak 4 in cold water for 20 minutes before using to prevent them from burning. Mix 1 tbsp of the balsamic vinegar with the lemon zest and juice, together with the garlic, honey and half the oregano. Add the chicken, and coat well in the marinade. If you have time, leave in the fridge for 20–30 minutes to marinate. Meanwhile, place the tomatoes in a small roasting dish with half the red onion pieces. Drizzle over 2 tbsp balsamic vinegar, add some seasoning and the remaining oregano and toss well. Roast in the oven for 20–25 minutes until tender. Preheat the grill to high. 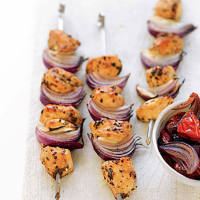 Make the kebabs by alternating the chicken and the remaining red onion pieces onto the skewers. Cook the chicken on the grill rack, turning regularly for about 18–20 minutes until the meat is thoroughly cooked and the juices run clear with no pink meat. Serve the kebabs with the roasted onions and tomatoes together with some essential Waitrose Easy Cook Long Grain Rice, and green salad leaves. To get ahead, why not use our prepared essential Waitrose British Chicken Breast Chunks instead? You could also cook the kebabs on the barbecue for a real taste of summer. These zingy, marinated kebabs are perfect with an elegant, light, crisp Riesling. Try the Kendermanns Special Edition Riesling 2007, Pfalz, Germany. 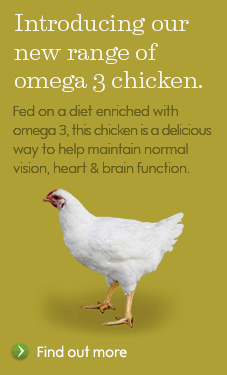 This recipe was first published in June 2009.